The Democratic Caucuses also held meetings at the convention. 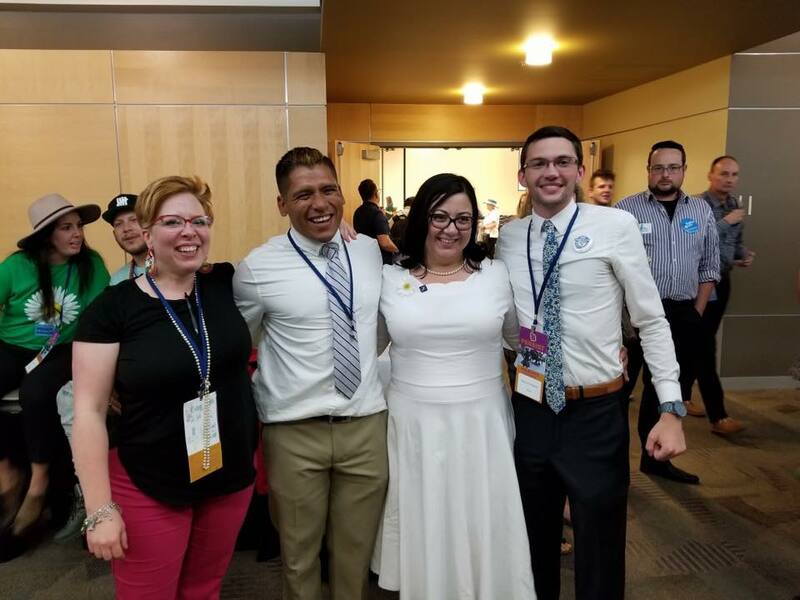 The role of Chair decides the direction of Utah State Democrats in policy and action, so this was an important election. Daisy Thomas ran on a platform of uniting the somewhat divided party, hoping to bring the disenfranchised Bernie supporters back into the fold. Daisy spoke a lot about cooperation, the lack-there-of in recent times and the need for it in the coming months. There were 9 candidates running for Chair, so this was a much more competitive election for the party than usual. Daisy Thomas also praised a group of people who were silently protesting the party’s decision not to release the results of the probe into allegations against Rob Miller. Miller had been accused of unwanted kissing, groping, and making inappropriate comments to women. Miller claims that the allegations were part of a conspiracy to ensure a woman would be elected to the position. The protesters stood with their backs to certain speakers who would have been involved with the probe, gagging themselves with tape over their mouths. There were also disparaging emails that essentially boiled down to finger pointing that were passed around to Utah Delegates, ranging from accusing candidates of Marijuana use to bringing up unpaid traffic violations. The accused responded to the email chains defending themselves, though at that point the damage is done and you have to ask yourself whether a response is dignified. These events seem to be a good example of the disorganization and divided nature of the Utah Democrats. Slinging dirt at each other on and off the stage and generally muddying the political process for blue voters across the state. Hopefully Daisy Thomas is up to the task of uniting the party and returning organization to the party. Let us know your ideas and reactions to this post. OurWrites.org is currently in the process of obtaining non-profit status 501c(4).